New Effects: 21 different sound effects for everything from cannon firings to receiving a sponsor gift (Press "-" to toggle sounds). 47 more detailed textures for landscape features and items on the ground (Press "_" to toggle textures). New Actions: Display most recent events that scrolled off the top of the screen (Press " key). Take or give leadership with respect to allies, so they tend to follow or not follow you around (Press "C" toward tribute next to you). New Behaviors: Tributes have different customizable heights (with Careers tending to be taller). Tributes occasionally backstab allies even before all enemies are dead, especially if the ally is weak and effectively dead weight, so beware! 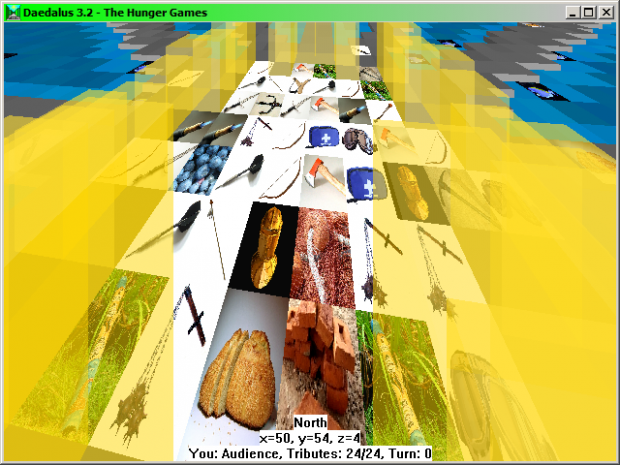 Interesting ways to modify "The Hunger Games"
This is an older release: You probably want to download the latest version 3.3 instead. It would be super amazing if there were more of a roleplay element to it like a training center and training scores, so you could socialize early and get alliances as well as see who is a threat. I know you're probably very limited to what you can do with this program but it's just a cool thought. This is a cool thought, although a training center should be implemented in a way that's not only fun for the user, but also has an effect on gameplay in the arena. The training center should involve different stations to practice at, which means there should be subtle differences in gameplay based on what areas tributes choose to focus upon. For example, knife throwing makes you do more damage if you get a knife in the arena, plant identification makes you better able to avoid Nightlock berries, and so on. Being able to socialize, make pre-arena alliances, see what other tributes are focusing upon, and getting a training score, are other elements that should be a part of this. What else can you simulate in your project? Battle Royale: This means everybody starts with a different random item (which may be very good, or very bad), and the game takes place on an island, like in the movie "Battle Royale". To do this, press Shift+F2 then enter "B" for the game mode. Will there be a game on android? Is it possible to play on a pc emulator? 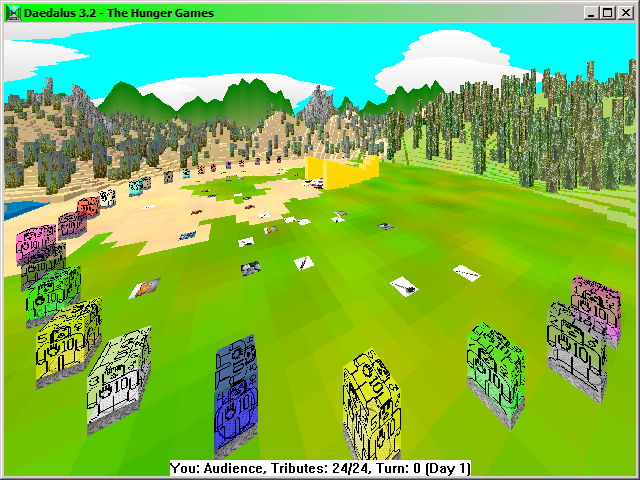 The Hunger Games Simulation is a PC game. That means it can't be played on Android or any other mobile OS. However it can be played within a PC emulator, which is the easiest way to play on (for example) the Mac. Hi, your simulator is beautiful. Can you tell us about update 3.3? When will there be new updates and what will you add(change)? Status line will indicate max hp and max food available in addition to current, if the max has been customized different from the default. Turning on textures (Ctrl+F12 or "_" hotkey) will give a warning about no textures available if none of the files are present. Fixed bug about tributes not responding to feast announcements properly (usually they would always come, and non-Careers would never decide to ignore it).